The Vistabella course has been carefully designed by the prestigious golfer Manuel Piñero, ex international pairs champion with Severiano Ballesteros. A very attractive course has been fashioned from a citrus grove, which is suited to all types of players. 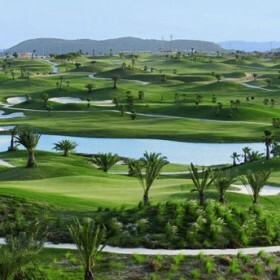 Professional golfer Manuel Piñero (ex world champion) has managed to design a truly interesting course, which is capable of offering enjoyment for the most expert professionals and amateurs who are new to the game alike. Manuel Piñero has built up an excellent record in his more than 30 years of experience in the world of golf and at Vistabella golf he has applied the criteria he has gained from playing at more than 500 of the world’s best golf courses, where he has competed as a successful professional. Variety is the main characteristic of Vistabella Golf: holes on a slope combined with other flatter holes, large and highly dynamic greens, wide fairways strategically situated raised bunkers and, of course, the large lake area, which will delight even the most expert players. 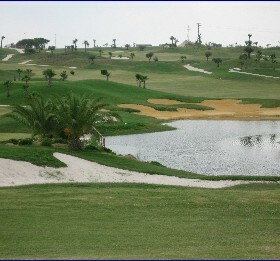 Vistabella Golf offers an interestingly designed round of golf that combines all the holes in a 9 or a 18 hole course. Vistabella Golf is designed for you to conveniently enjoy not only sport, but also your surroundings, making your visit here a rounded experience. The sun, the breeze, the grass… It’s all there for you! When someone visits Vistabella Golf for the first time they feel something special. They feel the care and attention that has gone into the course, which each detail has become an essential part of. Its integration into its natural surroundings and a responsible use of resources have made Vistabella Golf more than just a golf course, achieving a unique landscape with more than 34 hectares covered in autochthonous species of Mediterranean trees and bushes. These include three majestic pine trees, which are visible from almost any point of Vistabella Golf and are its symbol and icon. 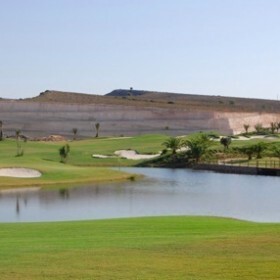 The course is just 12 km from the beaches of the Mediterranean, between the municipalities of Jacarilla and Orihuela, in an area with a tradition of golfing. It has very good road links for very easy access to the area’s major cities. The airports of Alicante and Murcia are less than half an our away. Vistabella Golf´s driving range is beautifully designed. It has 20 bays, some of which are covered, where one can practice on both mats and grass. Vistabella Golf also has a putting green next to the Club House and a large practice bunker to help you improve your repertoire of shots. The club house has all the necessary services to cater for you during your visit: golf shop, buggy hire, sports materials, etc. The club house also has changing rooms and a large car park. After having practised your golf, there is nothing better than having a well-earned rest in the Cafeteria/ Restaurant, which is situated beside the last hole and the club house. It is situated at the highest point of Vistabella Golf, so it enjoys an excellent panoramic view of the course. You can sit in the attractive outdoor seating area and chat about your best shots while having a drink or even trying something from the extensive menu, which contains a delicious variety of international cuisine. This course only opened n 2009 and the clubhouse/restaurant and pro shop/changing facilities are from temporary buildings. Vistabella also boasts a bowls rink and Padel courts.